We are a licensed construction company and we do flat roofs, flat roof repairs, flat roof inspections, flat roof maintenance in New Jersey for more than 25 years. Installing a new roof at your house is not a big deal if you hire GIKAS! One day roof installation, roof repair, roof maintenance in New Jersey with a 20 year warranty. GIKAS commercial roofing is an experienced contractor specializing in re-roofing, repairs, and maintenance services in New Jersey. 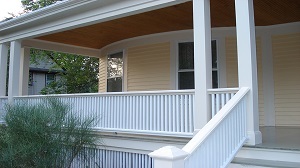 We have been painting and restoring older homes in Montclair and surrounding towns in New Jersey since the early 1980's. Our work philosophy known by our costumers as GIKAS WIZARD is creatively carried from project to project enhancing your home with texture, colors and details in order to comprehensively restore its charming properties.Absolute and uncompromised attention is given to the preparation of your home for painting as we will not stand the embarrassment to see your chromo symphony fall apart after a short period of time therefore our work comes with a standard warranty. Our experience with Gikas painting was fantastic. They had a vision for our home that far exceeded our expectations and they completed that vision within our budget. The front of our home was covered with aluminum siding for 30 years which was a look we were in a hurry to change. Gikas Painting removed the siding and restored the home to it's original look. We discussed the job with four different companies and Gikas Painting was the only one that suggested taking down the aluminum siding and restoring what was underneath. They worked with us hand in glove throughout the entire process. To say our house has been transformed is an understatement. Our "armadillo" neutral beige house is now a gorgeous old Victorian with the elegance and richness of it's original design. We hired George because he was the only contractor to look at our house and point out what used to be there by noticing the tiny details even we hadn't noticed. He is a true expert in his field of carpentry and the style of the homes in this town. Gikas is an artist that treats painting your home as a process in creating a work of art. Thanks! Looking at the before and after photos of our house brought back how dreary it looked before you came in. You made such creative suggestions for colors, did a terrific job of preparation and renewal of the shingles that were in disrepair, and opened up and restored our front porch so that now we have the pleasure of sitting outside. Your team was unfailingly pleasant and professional and responsive to all of our concerns. The painting and the carpentry that you did were of the highest quality. Thanks! I wanted to thank you for the wonderful job you and your workmen did painting and repairing our home. The attention to detail and the general neatness of the crew speaks to the quality of your workmanship. Our home was in need of a thorough paint job and many repairs, and now it looks almost new! Our neighbors keep stopping by to offer their compliments, so I pass them on to you. Also, I am so glad you suggested putting a railing on our back deck. Our promise as a painters and contractors is to build community value into every project while delivering professional expertise, exceptional customers service and quality construction.